In my last post I talked about how using live polling in email is a nifty way to collect 'real-time' interest indicators so I wanted to roundup a few of my fave examples and examine how the click data could be used for future personalization. At the end of the post I've setup a live vote - so please click to vote for your favourite example listed! Ahead of Black Friday, Currys PC World Business sent a poll to their subscribers asking them to vote for the products they were most interested in buying over the Black Friday period. Click data was then used to personalize Black Friday email content. As their subscribers clicked to vote, the preference was recorded in their ESP. On top of that, the percentages displayed in the email updated at open surfacing the live vote percentage for each category. Here's a great travel example from LateRooms.com. They sent a live poll asking their recipients to vote for their ideal break to gain valuable customer insight and follow up with relevant offers based on the click data. Polls are also super useful to use in the world of fast fashion and beauty. 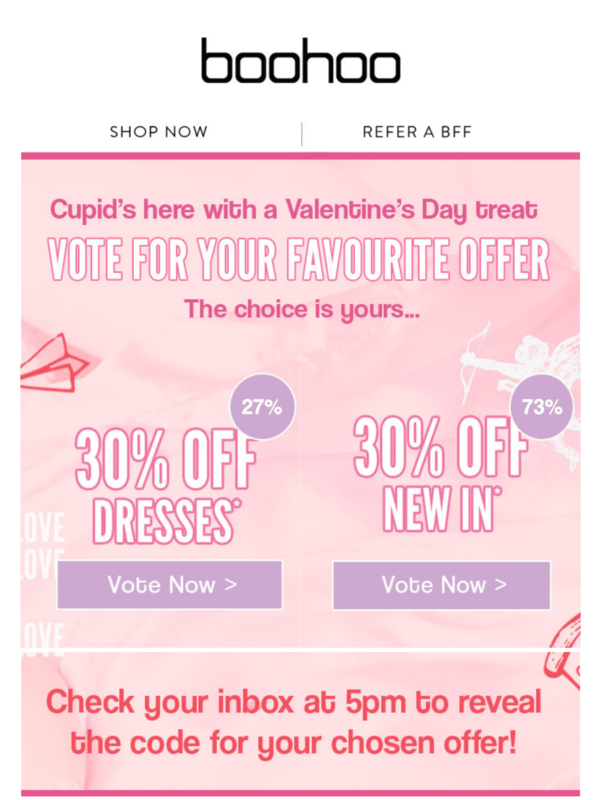 In this example, PrettyLittleThing asked their subscribers to vote for the products they couldn't live without. In the world of fast fashion, offers are King (or QUEEN). This poll by Boohoo offered subscribers the chance to vote for their favourite deal, with the winning deal going live at 5pm. Which would you prefer - 30% off dresses, or 30% off new in? 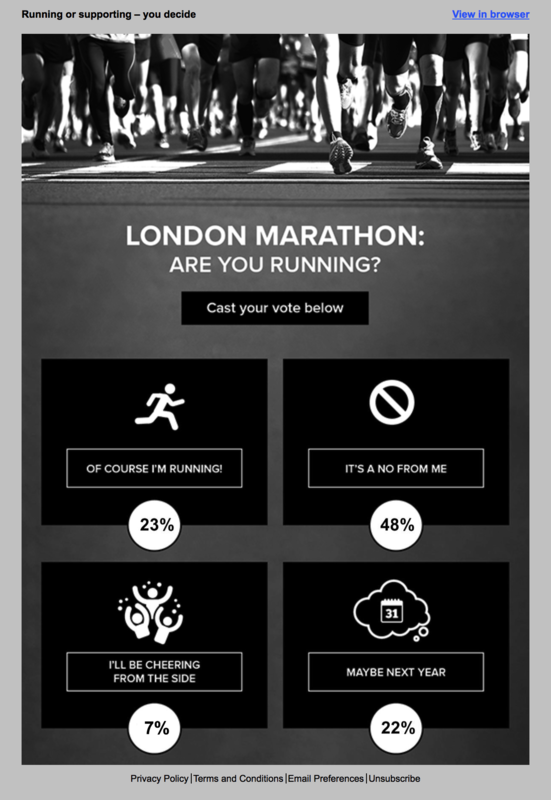 I love this poll from Bulk Powders collecting information about how their subscribers will interact with one of the biggest charity events of the year - the London Marathon. It's a lovely way to encourage interaction, whilst helping them to tailor content in the run up to the big day (pun intended). 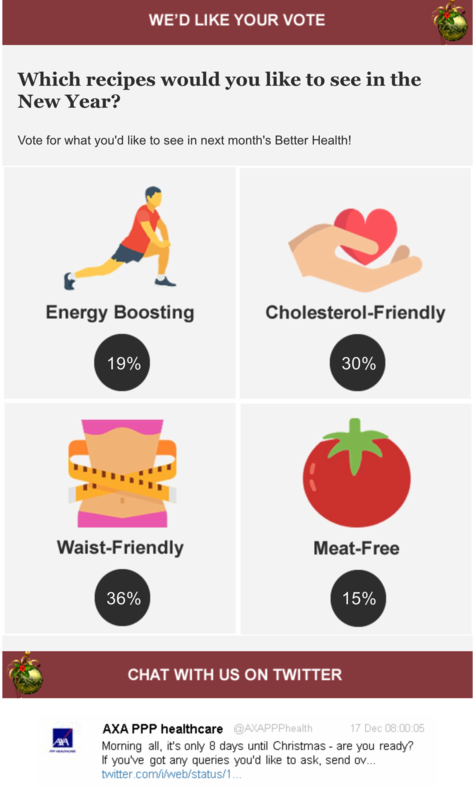 Ahead of the new year health kick, AXA sent this lovely poll to ask their recipients which recipes they would like to see in the New Year Better Health email. They also included a live Twitter bar for a friendly, personable touch. These are some of our favourite polling examples from the last few months. Love them too? Tell us which one is your favourite - click on the brand logo to cast your vote.